We are proud to announce that seniors Anthony Miller, Logan Hoppe, Brian Christensen, and Preston Schultz tied for first place in the category of TV Sports Event Production in the BEA Festival of Media Arts! This is the second year in a row that the Maverick Hockey Crew has taken first in the category. The students have already made plans to go to the conference in April and accept the award at the BEA’s annual festival, which coincides with the National Association of Broadcasters (NAB) convention in Las Vegas, Nevada. 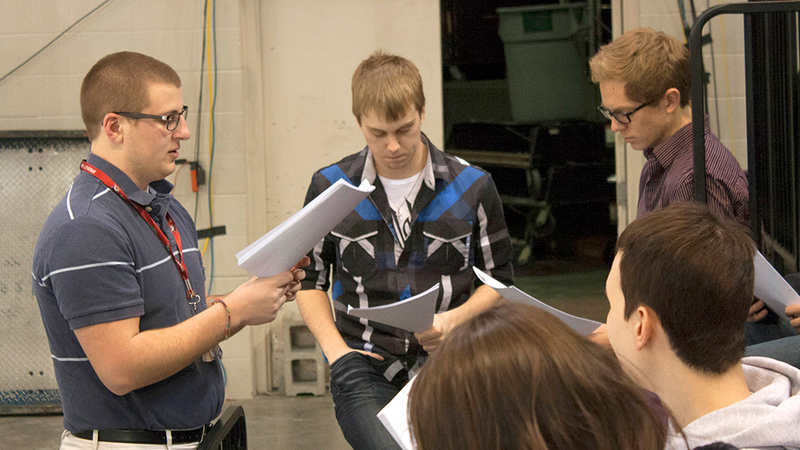 Anthony, Logan, and Brian discuss the night’s rundown with the crew prior to game time. Winning awards in contests judged by industry professionals shows the merit of our students’ hard work and dedication. We are continually proud to see Bethany students rank highly within the broadcast industry, and we’re excited to see where these seniors take their careers after graduation!